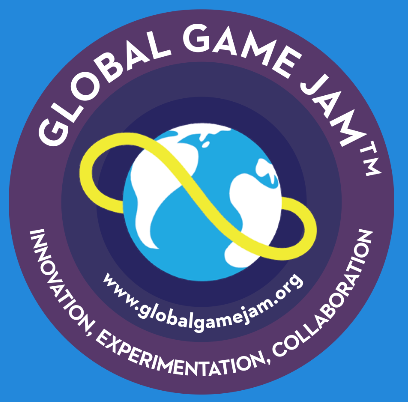 This weekend, I participated in Global Game Jam ’15, an international event where participants create games in 48 hours based on a theme. It’s a good break from the usual – a chance to take on roles and work with people that I haven’t worked with before, while chatting on social media with other jammers across the world. It’s inspirational and exhausting all in one, and I always look forward to this event. Brainstorming, team formation, and game creation vary widely from site to site. Rik Eberhardt has been running the Global Game Jam at MIT GameLab for 7 years now, using an approach that emphasizes team building and group participation. Friday: We watched the keynote address, including the theme. We formed into temporary brainstorming groups to come up with game pitches. Everyone with a game pitch wrote down pitch details on an index card, including a catchy title. 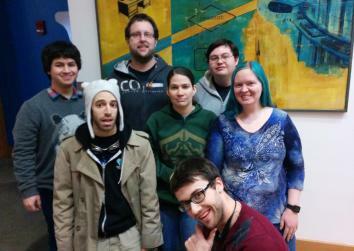 We reconvened as a group. Everyone with a game pitch went to the front of the room to explain their game and why other people should work with them. This produced a wall covered in index card pitches. We all had slips of paper with our names, color-coded to our disciplines (red for code, blue for audio, yellow for art, green for design/other.) We went and stuck our names on the pitches we wanted to work on. Rik walked down the row checking each game for headcount and adequate skill sets to complete the project. Repitch! Those who pitched a game and failed to assemble a team, got to pitch again in the hope of recruiting more team members. More assignment and shuffling, until all games looked viable. End of Friday, everybody out. Sleep is a good thing. Coffee. Energy drinks. Maybe food. Playtesting! The truth is, I’ve never had a GGJ project come in cleanly enough for playtesting on the cycles that Rik encourages (2 PM Saturday, 6 PM Saturday). Which is a pity, because he’s absolutely right about the importance of playtesting. End of Saturday. You don’t have to go home, but you can’t stay here. 3 PM Sunday: Pencils down – it’s over! One hour interlude while we tried to upload our games to the slammed GGJ site (much less of a problem this year than in prior years!) and did tech tests for the ending presentations. Presentations! After all, it’s far less fun to make games if no one sees them. We picked apart the sentence word by word, talking about the circumstances when people ask this question, about how “we” implied multiple people or multiple players, about how the question implied an initial lack of direction. And despite the open-ended theme, we came up with pitches. I don’t remember every pitch from my brainstorming group, but here are a few highlights. Quantum Leap: You’ve been plunged without context into a situation. There is something important you have to do and you don’t know what it is. Good luck! Morning After Adventure: You wake up naked with a stranger and no memory of the night before. Collect your clothing and learn more about your situation. Should you make your escape or make your move? Stockpocalypse: The world is about to end. You decide to play the stock market. Monitor social media with your teammates and figure out how you can make a killing. Human Tanagrams: A multiplayer game for Kinect. The game shows you a shape, and you have to arrange all the players into that shape. 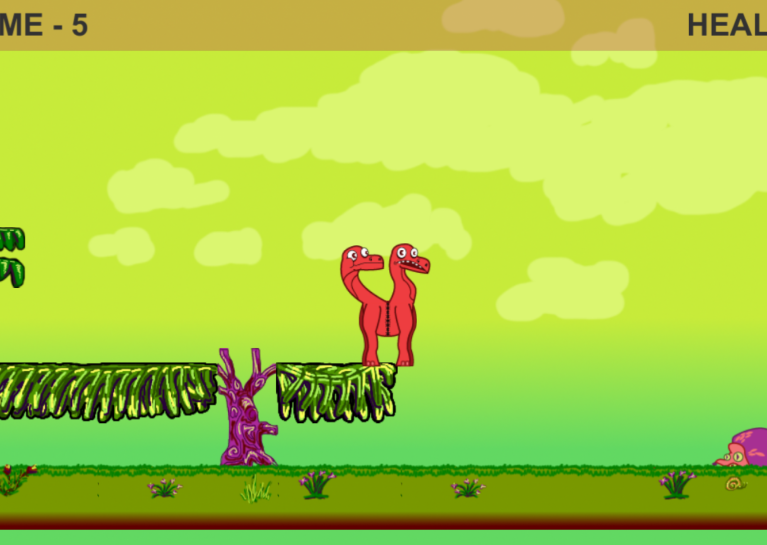 Two-Headed Dinosaur: A cooperative platformer for two players, each playing as one head of the dinosaur. The players need to enter commands simultaneously in order to progress through the game. I pitched Two-Headed Dinosaur, sat down, and watched hopefully as people pinned their cards to the board. My initial pitch got exactly one person: me. I got six more people. The recommended team size was two to four people. I had to proactively go and explain to Rik why he shouldn’t take my people away. The first three people who wanted to join Two-Headed Dinosaur were coders (Nathan Cope, Topher Campbell, and Jeremy Bird). They explained that they were working in a block – two novices learning Unity, with one Unity expert to teach them. My slip of paper was red for Coding, marked with “Unity 1, GameMaker 2, Inform 7 3” (where the numbers indicated my skill with that system, on a 1-3 scale.) I promptly ditched this plan and told the Unity block that I would do art, as long as they could handle code. Shortly after, we picked up one actual artist (Zachary Barryte), one level designer (Sarah Como), and one musician (Ben Bartlett). At that point, I was potentially extraneous, but I managed to elbow my way into environmental art anyway, because… well… it was my idea. Two-Headed Dinosaur was fantastically successful. We all had clearly delineated roles, and everyone had Unity experience, so we could ask key questions rapidly and then move forward with the game. That decision gave more personality to our game than anything else. Suddenly, instead of just a dinosaur, we had a dinosaur that had been stitched together by a wizard, with an associated tragi-plushy mythos. The goal object at the end of the level became a wizard hat and cloak, and the death animation became ripping apart at the seams to release a cloud of butterflies. …and now I want a plushie Frankenstein dinosaur. It is all Zachary’s fault. Also, thank you so much to the rest of my team! It was fantastic working with you, and I hope we cross paths again in the future. The controls are A/W/D for one player and arrow keys Left/Up/Right for the other player. When it says “Press Start together”, at the beginning, hit W and Up. Go here to play the game! The Two-Headed Dinosaur art and audio assets are now available under a Creative Commons Attribution-ShareAlike license. If you’d like to use our fantastic audio track, our adorable two-headed dinosaur, or our ropy purple trees in a future project, you have our blessing. Just please give us credit, and let us know you did!